No one explodes one of the longest-held misconceptions of music history better than Steve Lukather and his band Toto. The dominant pop-culture sound of the late-1970s and '80s was not in fact the smash and sneer of punk, but a slick, polished amalgam of rock and R&B that was first staked out on Boz Scaggs' Silk Degrees. That album was shaped in large part by the founding members of Toto, who were emerging as the most in-demand elite session muso-crew in LA, and further developed on the band's self-titled three-million-selling debut smash of 1978. A string of hits followed for the band going into the '80s and beyond. Running parallel to this, as stellar session players, Lukather and band-mates David Paich, Jeff Porcaro and Steve Porcaro were also the creative linchpins on some of the most successful, influential and enduring records of the era. In The Gospel According to Luke, Lukather tells the Toto story: how a group of high school friends formed the band in 1977 and went on to sell more than 40 million records worldwide. He also lifts the lid on what really went on behind the closed studio doors and shows the unique creative processes of some of the most legendary names in music: from Quincy Jones, Paul McCartney, Stevie Nicks and Elton John to Miles Davis, Joni Mitchell, Don Henley, Roger Waters and Aretha Franklin. And yet, Lukather's extraordinary tale encompasses the dark side of the American Dream. 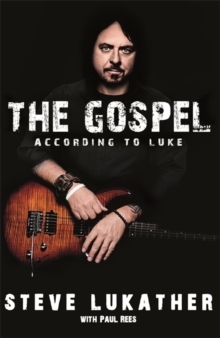 Engaging, incisive and often hilarious, The Gospel According to Luke is no ordinary rock memoir. It is the real thing . . .